On Thursday 10th December, Drake Music opened up their new studio space on the Springfield Road in Belfast. Not too far from their previous studio in the Westlink studios, this new space is an upgrade with a large studio space, a smaller music room with storage, a reception area, kitchen and office, with disabled access toilets opposite the studio door. This new space will enable Drake Music NI to double the amount of people it works with. Already a new intake of Drake Music Associated Musicians are being trained ready for the increased capacity. Drake Music NI’s new premises on the Springfield Road will enable it to double the number of people it works with using its unique computer music technology. 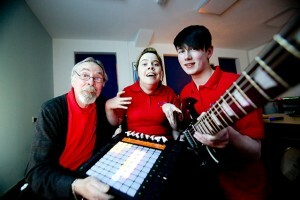 The charity receives core funding from the Arts Council of Northern Ireland. The new space has a large central area capable of accommodating 16 musicians and two smaller workshop spaces making a total capacity of 20 – more than double their old studio. The space is very versatile, totally accessible and allows for the full range of workshop in composition, performance skills, Djing and recording. Attendees at the official launch were treated a mix of music and mince pies. While enjoying the spread on offer, a montage of the previous year’s work by the Belfast based Drake Music NI’s Wired project, who also played a live adaptation of their latest music creation. Videos highlighting their work were then presented to the audience of funding bodies and service user groups who came to see what Drake could offer as Music Suppliers specialising in enablement and music composition. Image: Mary Louise, Davy and Niall played at the opening of Drake Music’s new state-of-the-art studios. The new studio space is available for groups who wish to partake in the latest state of the art music making equipment and our experienced Associate Musicians trained in music facilitation. Michelle would especially like to thank the landlord, Granite Properties, who have been incredibly supportive in their adaptation of the building to the needs of disabled musicians and carers. Drake Music has not only increased capacity but it also has additional equipment to do outreach work throughout the city. 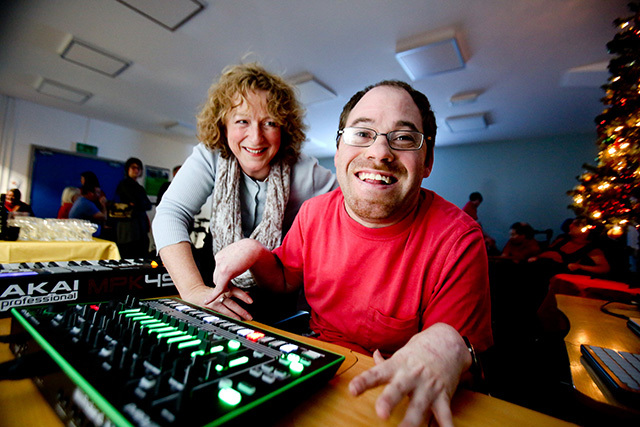 People can either come to the Drake studios or the charity’s specially trained music technology tutors can visit schools, day centres, arts centres, youth clubs and hospitals – they are completely flexible.